How to Fix Runtime Error 91 on Windows? Home »	Fix » How to Fix Runtime Error 91 on Windows? Issue: How to Fix Runtime Error 91 on Windows? I have installed Word to my new computer. Everything went fine during the installation. However, when I try to open Word, I receive an error message: ”Runtime Error 91: Object variable or with block variable not set”. Not sure what it is and how to fix it. 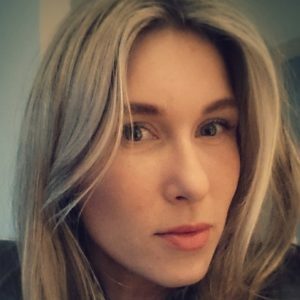 Could you help me? 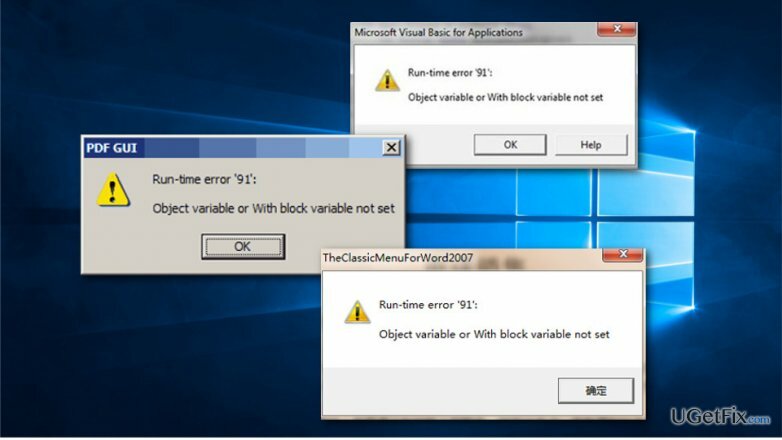 “Runtime Error 91: Object variable or with block variable not set” might occur anytime when trying to use various programs.The error informs about some issues related to “variables.” “Variables” are the set of options that are used in each computer program. They store various information that is necessary to for programs to run properly. The Runtime Error 91 might occur when something is wrong with “variable.” Often this error occurs when users try to run programs that use DCOMCnfg.exe file. This application controls file permissions and help programs to load up on the computer. When this file is corrupted, or some other issues arise, the program cannot work properly, and this error pops up on the screen. Apparently, you need to fix this file in order to get rid of this issue. You have to make sure that this file’s settings allow “Everyone” to use it. Sometimes this error occurs when trying to use the recently downloaded program. Nevertheless, the installation procedure was smooth; the error might still show up. The reason why it happens is related to the problems with a link of the downloaded software. Often Runtime Error 91 appears when this link is missing or interrupted. What is more, this error is often by the“Error 59999 – Application-defined or object-defined error.” The latter error might occur when generating a report to XML/Enhanced XML. This error is caused by insufficient permissions on the FRxXMLTag.XML file in the FRx directory. Thus, in order to get rid of this problem, you need to fix this file. As we already mentioned, the Runtime Error 91 might be followed by the Error 5999. If you face this problem too, you can opt for the Method 2. However, we strongly recommend using the first method in order to fix all issues that might be related to this error quickly and effectively. As you already know, the error might be related to damaged files and applications. The best way to find corrupted or damaged files is to use professional software. You should look up for the tool that is capable of fixing registry error and optimizing the system. However, we are certain that it’s easy to get lost in the variety of the similar programs. Though, we want to help and suggest installing and scanning the system with SpeedyPC Pro. This tool will find and fix all issues that might be causing Runtime Error 91. Though, you can choose your preferred tool as well. In Windows Explorer browse to FRx directory. Right-click on the FRxXMLTag.XML file and select Properties. When in Properties, click the Security Tab. In Security Tab, add the group Everyone and select Full Control.